It is perhaps forgivable that one of Shakespeare’s better known and universally enjoyed plays, A Midsummer Night’s Dream, is produced rather too often. However, its playful language ensures that it never fails to amuse and when well-produced, the audience can enjoy a new take on the way the script can be interpreted through a director’s artistic vision. I have seen several different productions and not once have they come across as repetitive. It can certainly be said that Theatre Britain’s production in the courtyard of the President’s Palace at San Anton Gardens did not fail to please and entertain. Paul Stebbings has once again done a sterling job with his clever direction while Eric Tresser Lavigne’s choreography created excellent visual impact on the stage, especially when set to Paul Flush’s music – with live accompaniment by the cast themselves. While I was not entirely certain about the playing up of the back-story where Hypployta, Queen of the Amazons, is captured and conquered by the Greeks and forced into becoming Thesus’s consort, the interpretation allowed Noa Bodner to give her Hypployta a much feistier attitude than the more usual submissive role other productions tend to give her. For the first time, I actually saw her role as a concrete character rather than a shadowy filler. 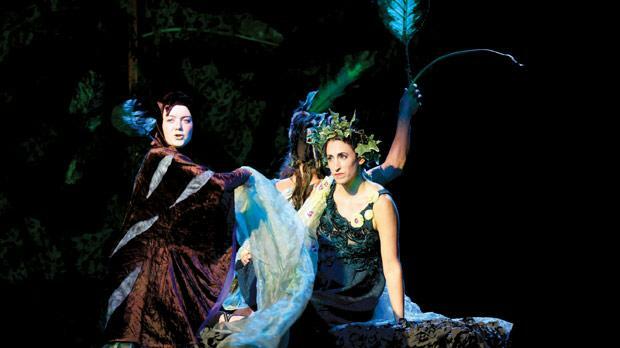 Bodner did a very highly commendable job both as Hypployta and as Titania, the fairy queen. This second character mirrored the strength of will which she had already established as the Amazon Queen. While it is an oft-used device to have the characters playing Hypployta and Thesus to double for Titania and Oberon respectively, one of the recurring showcases of technical excellence which this theatre company exposes is the impeccable art of doubling. Eric Tresser Lavigne’s cunning Oberon may have outshone his Thesus but was equally matched by his bumbling Peter Quince. The Mechanicals in the play-within-a-play were terrifically funny and their over-the-top acting so well hammed that it was clearly the mark of a highly talented cast who knew exactly what they were doing. What was particularly interesting was the fact that the actors playing the four young lovers also played others parts. Dominic Brewer managed to lift Lysander out of the usual interpretation as a handsome but rather sappy lover and made him a much more artful and, certainly, more comedic figure. He made a great counterpart to the diminutive Hermia, played by Maeve Leahy, who made the role her own by giving it the right amount of naivety when it required it, without losing her fighting spirit when she needed to defend herself. Brewer’s Puck was particularly hard to coordinate because of the countless quick changes and instant character transitions which he had, including some excellent masks and body swaps which were done so slickly that the changes were almost imperceptible. It was a laudable performance which was also highly entertaining. Leahy’s Francis Flute, the bellows-mender, was bumbling and earnest and earned quite a few laughs, while Brewer’s Snuck the joiner had a dead-pan expression and slow demeanour which made for some very humorous scenes that depended on the actors’ sense of timing. The performances I enjoyed the most were the roles played by James Burton, who portrayed Demetrius and Bottom, as well as Rebecca Naylor’s Helena. Burton managed to turn the slightly annoying Demetrius into a very likeable character, while his interpretation of the over-confident Bottom made for an irreverently loveable fool. The manner in which he transitioned from the geeky Demetrius to the loud Bottom was great to watch and his interaction with Naylor’s Helena was great. The latter worked very well with the rest of the cast to create a strong dynamic and she portrayed an essentially good but highly neurotic young woman perfectly. The effrontery she believes she faces makes her indignant enough to start the perfect argument in the lovers’ quarrel scene, which was perfectly choreographed and a joy to watch. Coming as it did, at the very end of the summer season, following the August lull, A Midsummer Night’s Dream served as the perfect introduction to the autumn/winter theatre schedule. TNT always put on an excellent show, proving that good theatre can keep Shakespeare relevant and entertaining even in the contemporary digital world – weaving a web of magic and joy which elevates its audiences from the mundane.